If you saw my Christmas gift guide for busy Mums for 2015 you’ll know I’d been trying out the Lumie Body Clock Iris. I’ve always thought that I’m quite a morning person, but honestly, these grey winter mornings are enough to make me turn around and hide under my duvet (even with toddlers leaping on me). Instead, the Lumie bodyclock wakes you slowly each morning, avoiding that sudden, grim shock of the alarm. The light is specifically designed to promote those hormones in our body that tell it to get up and go and suppress the “I need to sleep some more” hormones. Amazing isn’t it? 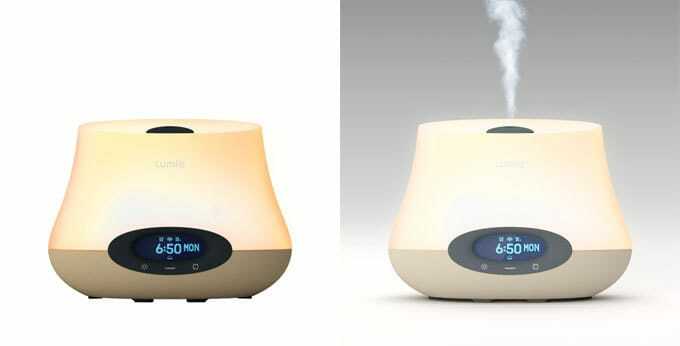 The Lumie Iris Bodyclock includes an essential oil function, to combine the positive effects of the gradual sunrise and sunset with aromatherapy. A fantastic addition to your morning routine, for anyone who needs a brighter start to the morning. The Lumie Bodyclocks start at £59.95 and the Iris is £160.00. In my own bed – I always sleep badly when away from home! In a massive, heaven-like bed in Prague! I was in a hotel room in Manchester and had a double bed to myself. So soft and fluffy. At home, my own bed, all to myself! On holiday in Whitby, listening to the sea. When I stayed with relatives in Cornwall. The bed was so comfy that I slept right through the night which is rare for me. Formerly, Mint Hotel in Bristol, it’s a soundproof hotel. In my cosy, warm bed. In a Premier Inn bed! I need one of their hypnos matresses! the first time my children slept through – bliss! My best sleeps are always in my bed! It has to be at the Hilton hotel in Liverpool at Liverpool ONE! The bed was super high, padded and comfy and I’d love one for at home! My own bed, after I’ve been away somewhere. Hello, I’d love to say when we got back from Obergurgl after those horribly hard beds, but sadly my eldest had me up ’til 4am with symptoms from his tummy bug! I’m such a bad morning person though, I’ve been coveting one of these Lumie clocks for ages! The first night at home from University where I had the most uncomfortable bed ever. Getting into my own bed I never wanted to leave it again. As you can see from the time of this comment my sleep pattern is completely haywire since the birth of our baby daughter 🙂 It’s hard to remember my last good night’s sleep. Oh yes it was at the Sofitel Hotel at Gatwick. The bed was the most comfortable and peaceful and it was huge! Under the stars in death valley, miles from another single sole and with my partner. In my own bed, when I was a child. Not such a good sleeper now. in my bed after jetlag from a holiday! In a gorgeous bed in Wellington after spending 6 weeks travelling around New Zealand in a campervan. Pure Luxury it was! The night before I had my baby. My life has never been the same since! A surprise weekend in the Lakes – tranquil and totally relaxing. On our old bed, our new mattress just isn’t the same. I’m a terrible sleeper, I honestly can’t remember when I last had a good night’s sleep. in a cottage in the Lake District – those long hill walks really do help! My best night’s sleep ever was in a caravan at the coast as a child, apparently there was thunder, lightning and giant hallstones – I never noticed. In a posh hotel in Edinburgh whilst on holiday 3 years ago. I don’t know what kind of mattress the bed had, but it was fantastically comfortable! In my own bed, its so big and comfy i always get a great nights sleep. To be honest, I can not remember ever having a good nights sleep! When I’m camping near the beach with my kiddies, blissful! My best night’s sleep was in South Africa! I was just so chilled, I didn’t have my laptop with me, I didn’t really use my phone. It was lovely! In a holiday cottage in the Lake District about 4 years ago in the comfiest bed in the world! Now, a full nights sleep is a distant memory and I would love one! At home. I love my own orthopedic bed. My best night sleep is definately in my own bed as its adjustable I can get into the perfect sleep position every night. I love it. I’VE HAD TROUBLE SLEEPING FOR SO LONG I HONESTLY CAN’T REMEMBER! In my own bed after coming home from hospital. My best nights sleep was arriving back home after a two day drive back from Portugal. There’s nothing like sleeping in your own bed, bliss. They say there’s nothing like tor own bed, and it’s definitely true, especially after camping trips, hospital stays and wild nights on the town. On my honeymoon! lol The hotel was 5* and the bed was heaven! I have never felt a softer bed! at home in my own bed the night after a month away in malaysia – exhausted from travel and all the adventures. it was a great sleep. In my own bed with fresh linen and after my yoga session! Hotel in Pasadena – when checking out they gave you a leaflet so you could buy the same type of bed. It would have to be at The Royal Garden Hotel in London many years ago now. Bed was massive and so comfy. It was in a hotel bed in Las Vegas. It was the biggest most comfortable bed ever! Any time I have a double bed to myself! While on a particularly rough crossing from North Shields to Amsterdam, rocked to sleep all night. The fun came the next morning trying to get showered and dressed. About a year after having my son I had to go to India for a week for work – the 5 nights in that hotel were the best sleep ever – a double bed to myself, no wake up call from the baby! Bliss! At home, in my own bed when my partner is not on nightshift. Whenever I get a chance to sleep in a double bed all to myself! In our massive king sized bed when on holiday in Jamaica with air conditioning & lots of filled days I slept like a baby each night! Erm I can’t remember the last time I got to sleep all the way through. Our little girl not coming into our room until 4am is an absolutely refreshing bonus though! At my mum’s house – the bed I sleep in when I go back to visit is super comfortable! My best night’s sleep was in hospital after I had an operation on my knee. I think it must have been the morphine to be honest but I was totally sparko and never so relaxed. In my bed at home. I treated myself to a memory foam mattress last November that first night was amazing and still get such a good nights sleep now its amazing! A little B&B in the Lakes after our annual anniversary walk to Loughrigg Terrace. Amazing what some fresh air and hills does for you! Best sleep I ever had was in a hammock at a friends house during the summer months outside. I was 14 at the time on a sleep over. It felt amazing waking up to fresh warm air in the morning. On a cruise ship in rough seas!! Hotel bed in Bruges! Amazing! My best nights sleep ever was so good that I can’t remember it I was probably asleep at the time. I think it was at a hotel in cardiff after a busy day of travelling – the beds were so comfy! On a memory foam matress at a friends house! I remember as a kid visiting family for a wedding and there were about 12 of us on the floor laughing and giggling under the blankets as we crashed on the floor. Nice sleep, eventually. In my own bed. I have an insomnia cure on my website, and use it every night. Loads of zzzzzz. When we used to have a super king water bed!! First night in our new home, new bed, mattress and bedding! in my own bed on a summer night when i was a kid. at home in my bed with my new mattress, heaven! oddly enough was on a road trip from uk to romania, i slept 9 hours without waking up !!!! My best night’s sleep was in a sleep lab after being kept awake for 48 hours wearing electrodes! I was out like a light! In a posh hotel in the caribbean – I was relaxed and had had a few cocktails to help me sleep! At home in my own bed.. when everyone was away for the weekend. Bliss! After a long, worrying day with my son in hospital – I was so relieved that he was safe and recovering, that I got home, collapsed into bed and just slept the hours away. Anywhere so long as I have a fresh breeze on my face. I sleep with the window open even in winter! Definitely in Miami Sofitel Hotel , they had the MOST comfiest bed and my first time sleeping on a down mattress topper – Heaven ! A trampoline! I was laying looking up at the stars with my now husband, was beautiful. last night in a hotel i was in. so luxorious! The first night back in my own bed after spending the most horrific fortnight in a horrible lumpy excuse of a bed while on holiday in Portugal. The glasshouse in Edinburgh, best mattress I’ve ever slept on! On a cruise when it was quite rough but the rolling sent me into a lovely dreamy sleep! When my daughter first slept through the night! My best night’s sleep was when I had the assistance of a prescribed sleeping tablet! My best night’s sleep ever was in an old fashioned French hotel room which had a deep hip bath and a bed with starched cotton sheets and huge pillows and bolsters. It was such a treat to flop into that bed after a long hot bath. I always have a good night sleep! Most nights are good, but I do have to wear earplugs as I’m such a light sleeper. in Boston, USA staying in a lovely hotel with the biggest bed ive ever slept in!! The first night after I split from my ex. Bed all to myself and all the stress of being in a poor relationship had lifted- bliss. The first night the family arrived at Pleasurewood suits in Florida, in 1992. The get up for the plane that morning had been so early, and the plane journey itself so long, that I was falling asleep by the evening in the hotel. Went to sleep in minutes after getting into bed! In my own bed ???? I’m an owl so when I go to bed at about 1am I sleep like a log every night. My problem is getting up. I even sleep through alarm clocks on a regular basis. Now retired I usually rely on hubby to shake me awake!!!! In a tent at Snetterton race circuit, it rained all night and the sound of the rain on the tent was so relaxing. In my own bed. There is no bed like my own! On Holiday in Cornwall – In the biggest comfiest bed ever at a posh hotel! Chapneys on a night away with my Mum! In a hotel in Blackpool! Having Fibromyalgia and ME I spend a lot of time in bed, some weeks sleeping constantly some not sleeping at all in so much pain, I need a new bed really. I can’t remember but it must have been in my bed cos I don’t sleep very well anywhere else. Nothing beats my very own bed and pillow always sleep there best. At my mums house when the kids were smaller and didn’t sleep and she wore them out, let me go to bed early and I sunk into clean sheets and 9 hours of unconsciousness!!! In my own bed the day we bought a new mattress at last! It’s been years (before I had kids) since I’ve had a good nights sleep. I would say that when I used to go camping in the Peak District and breathing the fresh air. In the spare bed at my mums house! She has the most comfortable beds! In Egypt on a solo holiday – no competing noises! In my own bed, the night I got back home after being in a rather uncomfortable bunk bed in Africa for more than a week! My best is on my own when I don’t have to wake up early . My bed at my old house when we got a brand new mattress – amazing! In my bed with my new super duper mattress – bliss. In a bed in the Teachers’ flat I lived in in China, the mattress was ultra firm – after about a week I stopped waking up with bruises and started sleeping like a log! I usually sleep very well in my own bed – I have amazing pillows!! At home in my own bed with my partner Ross. A few years ago we were lucky enough to stay in Yosemite national park ( in a hotel) it was so quiet there that i slept [perfectly and only woke when the sun rose high enough to go over the mountain – an amazing place and would love to go back sometime. when i stayed at a premier inn, the beds are amazing there! I always sleep best in my own bed. In my own bed after buying a new mattress. In my own bed but after taking piriton for an allergy. I slept all night without waking up once! My best nights sleep ever was the night we finally got home after our honeymoon and a week traveling home as we were stranded by the ash cloud in 2010! In a log cabin in the New Forest! My best nights sleep ever was at my friends house. Her parents got me out a mattress on the floor and made the bed with goose father pillows and duvet. I slept for 14 hours straight and they eventually had to wake me up!